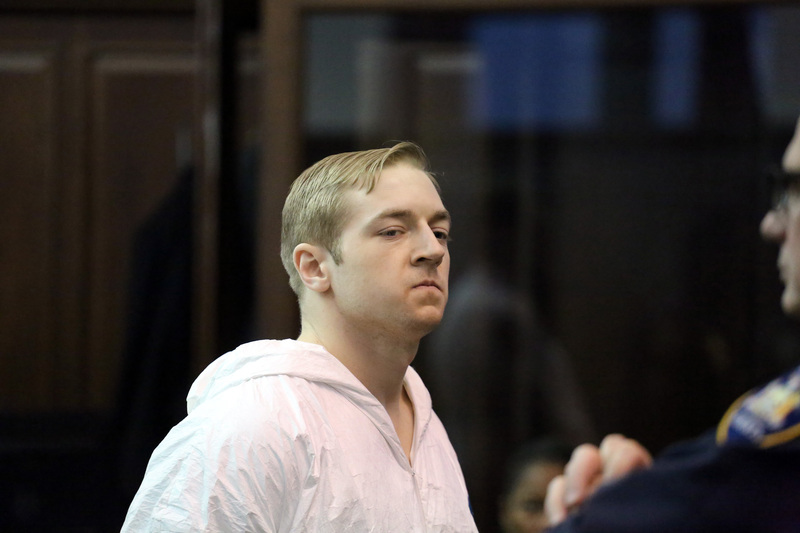 MANHATTAN — The Baltimore man who fatally stabbed a black man in Hell's Kitchen told police the thought of it as "practice" for a murder spree he intended targeting black men in Times Square, prosecutors said Thursday. James Harris Jackson, 28, was silent with his hands cuffed behind his back as he was arraigned Thursday afternoon for murder as a hate crime in the stabbing death of Timothy Caughman, told police that his violent plan was motivated by anger over black men mixing with white women, according to his criminal complaint. 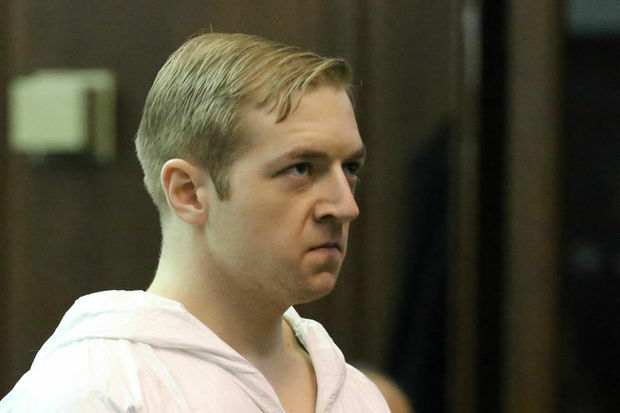 "Mr. Jackson had come to New York from Maryland several days earlier for the purpose of killing black men and had stalked numerous potentials victims," prosecutors charge. Assistant District Attorney Joan Illuzzi said at the hearing that terrorism charges could be added. "We are considering and expect additional charges on a grand jury level," she said. "This was an act, most likely, of terrorism." Jackson turned himself in to police in the Times Square subway station Wednesday about midnight, officials said. "You need to arrest me," he told the officer. "I have knives in my pocket." He was held without bail at the end of Thursday's hearing. "I felt a chill when he came into that courtroom. I felt like I was looking at pure evil. I was frozen," said Black Lives Matter activist Hawk Newsome. Jackson, who's reportedly a decorated Army veteran who served in Afghanistan in 2010 and 2011, lived in Baltimore but traveled to New York on St. Patrick's Day to kill black men in "the media capital of the world," police said. "The defendant was motivated purely by hatred," Illuzzi said. Jackson had harbored a hatred toward black men for more than a decade and once in the city started stalking them, police said. In one instance, cameras recorded him following behind a man only to pull away before attacking him, police said. But then, on Monday, Jackson came upon Caughman, who made a living collecting bottles while keeping a Twitter account chronicling the celebrities he met, and who was rummaging through some trash, police said. Jackson plunged a 26-inch sword into Caughman's chest — puncturing his spleen, bowels, pancreas, diaphragm and lung — and stood over him as he pleaded, "What are you doing?" according to prosecutors. Jackson stood and walked east on West 36th Street while Caughman managed to stumble to a nearby NYPD stationhouse where officers got him an ambulance which brought him to Bellevue Hospital where he died, officials said. Jackson washed the blood off himself before ditching his blade in a Washington Square trash can, prosecutors said. Police broadcast video Tuesday night showing Jackson fleeing from the scene with groomed hair and a long black coat. Jackson saw his face plastered across media reports citywide and then turned himself in to police in Times Square, telling them he had two knives on him, police said. He told investigators the murder weapon was in Washington Square Park, where they ultimately discovered it, officials said. Jackson confessed to investigators that he killed Caughman and that he thought of it as a test run before unleashing his violence on men in Times Square, prosecutors said. "His intentions were to come here, harm black males. We're very fortunate it stopped at one and it wasn't more," according to NYPD's Chief of Detectives William Aubry. Jackson's lawyer, Sam Talkin, cautioned against a rush to judgment about his client. "What we’re going to do is take a few minutes, let the dust settle and figure out what the facts are. If the facts are anything near what the allegations are, then we’re going to address the obvious psychological issues that are present in this case," he said.